The Show Answer button does not work for JS input problems. By default, the Show Answer option is set to Never. If you change this option in the problem component, a Show Answer button appears in the learner’s view of the problem in the LMS, but the button does not work. In the unit where you want to create the problem, under Add New Component select Problem , and then select Advanced. In the component editor, modify the example code according to your problem. Be sure to specify a title attribute on the jsinput tag. This title is used for the title attribute on the generated inline frame. (Optional) To add a Save button to your problem, select Settings, and then set Maximum Attempts to a number larger than zero. All problems include more than one resource. If all the resources in a problem have the same protocol, host, and port, then the problem conforms to the same-origin policy (SOP). For example, the resources http://store.company.com:81/subdirectory_1/JSInputElement.html and http://store.company.com:81/subdirectory_2/JSInputElement.js have the same protocol (http), host (store.company.com), and port (81). If any resources in your problem use a different protocol, host, or port, you need to bypass the SOP. For example, https://info.company.com/JSInputElement2.html uses a different protocol, host, and port from http://store.company.com:81/subdirectory_1/JSInputElement.html. To bypass the SOP, change sop="true" to sop="false". In the example problem code, this attribute is just before the closing customresponse tag. If you bypass the same-origin policy, you require an additional file. The example problem uses the file jschannel.js to bypass the SOP. For more information, see the same-origin policy page on the Mozilla Developer Network site or on Wikipedia. The value of "answer" is the JSON string that "getGrade" returns. The value of "state" is the JSON string that "getState" returns. Clicking either "Submit" or "Save" registers the current state. Keep the following points in mind about this example problem. JSInputDemo.getState and JSInputDemo.setState are optional. You need to define these functions only if you want to conserve the state of the problem. Width and height represent the dimensions of the inline frame that holds the application. The response is graded as correct if the correct option is selected in the dropdown control when the user selects Submit. Selecting Submit registers the problem’s current state. 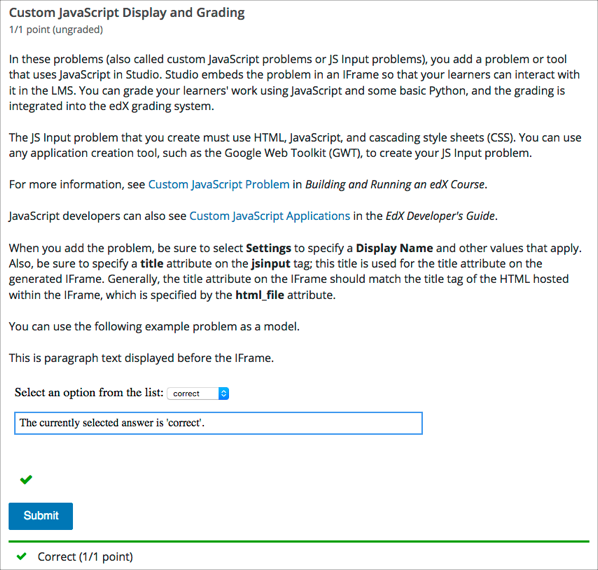 JSInput allows problem authors to turn stand-alone HTML files into problems that can be integrated into the edX platform. Since its aim is flexibility, it can be seen as the input and client-side equivalent of CustomResponse. A JSInput exercise creates an inline frame (iframe) in a static HTML page, and passes the return value of author-specified functions to the enclosing response type (generally CustomResponse). JSInput can also store and retrieve state. The following is the basic format of a JSInput problem. def all_true(exp, ans): return ans == "hi"
The html_file attribute specifies the HTML file that the iframe will point to. The HTML file must be located in the content directory. The iframe is created using the sandbox attribute. Although pop-ups, scripts, and pointer locks are allowed, the iframe cannot access its parent’s attributes. The HTML file must contain a gradefn function that the JSInput file can access. To determine whether the gradefn function is accessible, in the console, make sure that gradefn returns the right thing. When JSInput uses the gradefn function, gradefn is called with gradefn .call( obj ), where obj is the object-part of gradefn. For example, if gradefn is myprog.myfn, JSInput calls myprog.myfun.call(myprog). The title attribute specifies the title for the generated iframe. Generally, the title attribute on the iframe should match the title tag of the HTML file that is hosted within the iframe. The gradefn attribute specifies the name of the function that will be called when a user selects Submit, and that returns the learner’s answer. Unless both the get_statefn and set_statefn attributes are also used, this answer is passed as a string to the enclosing response type. In the customresponse example above, this means cfn will be passed this answer as ans. If the gradefn function throws an exception when a learner attempts to submit a problem, the submission is aborted, and the learner receives a generic alert. The alert can be customized by making the exception name Waitfor Exception; in that case, the alert message will be the exception message. To make sure the learner’s latest answer is passed correctly, make sure that the gradefn function is not asynchronous. Additionally, make sure that the function returns promptly. Currently the learner has no indication that her answer is being calculated or produced. Sometimes a problem author will want information about a learner’s previous answers (“state”) to be saved and reloaded. If the attribute set_statefn is used, the function given as its value will be passed the state as a string argument whenever there is a state, and the learner returns to a problem. The function has the responsibility to then use this state appropriately. The previous output of gradefn (i.e., the previous answer) if get_statefn is not defined. The previous output of get_statefn (see below) otherwise. It is the responsibility of the iframe to do proper verification of the argument that it receives via set_statefn. The enclosing response type must then parse this as json. The height and width attributes are straightforward: they specify the height and width of the iframe. Both are limited by the enclosing DOM elements, so for instance there is an implicit max-width of around 900. In the future, JSInput may attempt to make these dimensions match the HTML file’s dimensions (up to the aforementioned limits), but currently it defaults to 300 and 400 for height and width, respectively.